easier than fighting it with the LTD.
split screen game and two profiles). 1.In the Inventory Lobby, invite a friend. Eggs, First Aid, Ammo) off to the guest for duplication. progress will be lost" -- select "Yes"). "No" and do not save ammo and status. 7.Restart the game with the two characters and you'll both have the ammo and items. Addendum: A popular money-making strategy involves duplicating Gold or Rotten Eggs. has quit out to make this process faster. Bonus Features (for that weapon only). In Mercenaries mode, ammunition drops are based on the type of weapons you have. Samurai Edge to find more Magnum and Shotgun ammo. still have to fully upgrade any additional weapons to get their maximum power. spinning around, looking for you. Shoot him with a rocket then. game. There are thirty emblems total, and not each chapter has one. gives a scathing critique of the American Dream. you'll see a quick cutscene of a fellow in an unfortunate predicament. In this immensely stupid Easter Egg, Chris and Sheva can take a short rest in a chair. and Chapter 6-2 (the Captain's seat). That is all. a Gatling gun. Knock on it to find a hidden Majini. setting to unlock the Infinity Rocket Launcher. pause game play and quit the game. Save the game when prompted. Restart any desired chapter. treasure, weapons, and ammunition from your previous saved game are still in your inventory. each. You will gain 11,322 gold each time you do this (if you have all your slots full). This is also a good way to stock up on ammunition. that chapter and collect lots of money and ammunition (especially for the machine gun). Repeat this several times and you will be able to upgrade every weapon in your arsenal. then gather all the treasures and money they dropped. Press the button to the elevator. Lickers you are meant to defeat, which will make for easy money for weapon upgrades. "Bonus Features" as you would do for normal guns. this trick while climbing ladders or jumping. Reload your weapon when the melee option appears. Then, start the melee sequence. Your weapon will be reloaded instantly. Picking up an item allows you to dodge an attack. This works best when surrounded by enemies. a counter-attack. Kill him, stand over the item that he drops, and continue. Beat the game to unlock figurines you can view in the bonus galleries. corporation in Devil May Cry 2, another Capcom game. his mouth. Throw something in his mouth. Repeat this and it will be defeated in five minutes. U-8's mouth and blast it. It will be dead in less than three seconds. send the beam of light to the statue instead of the final mirror. locker after you drop down into the locked room. the bridge, turn to your left, and jump over the rock to collect the gem. cart tracks. Follow the wall to a chest containing the gem. at the top of the large ladder to shoot it down. Chapter 4-2: After putting all three emblems in the door, go up the stairs. Shoot the gem down from above the big door you have to enter. around to the right. The gem is in one of the pots at the end. to open. The gem is in a drawer in the room between the guns. an assist event to open. the gem is in one of the three treasure chests. found elsewhere in multiple locations. the previous fight by damaging Wesker enough to make him retreat. and the one nearby in the little pot. that unlocks, send the beam of light to the statue instead of the final mirror. in it. The gem is in that chest. needs an assist event to open. as you enter the room. the shelf to the right as you enter. reaction event (before climbing the stairs to the exit). gem is high on the wall in front of you as you cross the drawbridge. and one of them will drop it. and on your way to the crank, turn right after the stairs. straight towards the end. The gem is in the treasure box. Recruit (15 points) : Complete all chapters on Amateur. Soldier (15 points) : Complete all chapters on Normal. Veteran (30 points) : Complete all chapters on Veteran. War Hero (70 points) : Complete all chapters on the most difficult setting. Army of One (15 points) : Win 30 matches in Slayers. Bringing the Pain (30 points) : Defeat 100 players using physical attacks in Versus. Eye of the Tiger (15 points) : Win 30 matches in Survivors. It Takes Two to Tango (15 points) : Chain a 40-defeated combo in Team Slayers. It's All About the Points (15 points) : Score at least 40,000 points in Survivors. Keep the Good Times Rolling (15 points) : Chain a 20-defeated combo in Slayers. Let's Get This Party Started! (20 points) : Unlock all selectable characters in Versus. There's no "I" in Team (15 points) : Score at least 80,000 points in Team Survivors. We Will Survive (30 points) : Win 30 matches in Team Survivors. Must've Got Lost (15 points) : Complete "Lost in Nightmares" on any difficulty setting. Night Terrors (40 points) : Complete "Lost in Nightmares" on Professional. Getaway (15 points) : Complete "Desperate Escape" on any difficulty setting. The Great Escape (15 points) : Complete "Desperate Escape" with an S rank. Run the Gauntlet (40 points) : Complete "Desperate Escape" on Professional. to unlock the Professional difficulty. in the "Bonus Features" gallery. 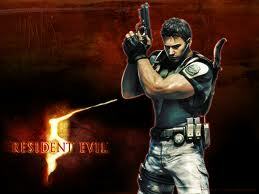 a rocket launcher before entering chapter 6-2.
wesker first appears at the end of chapter 5-3 with jill. you cant harm him this time. all you have to do is avoid him for 7 minutes. thats all. second rocket quickly and he is stunned. quickly go near him and give him the shot. you have and he is done once and for all.